Peacefully at Soldier's Memorial Hospital, Orillia on Monday, September 11, 2017 at the age of 72. Loving wife of the late Ken. Devoted mother of Mike (Barbara) and Mary Curtis. Proud grandmother of Bradley, Jessica, Patrick and Shelby and great-grandmother of Erin and Hayden. Dear sister of Tom (Judy), Carol (B.J.) and Paul (Theresa) and sister-in-law of Ward. 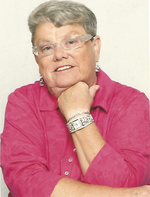 She will be lovingly remembered by her dear friend Mary Ellen and all of her extended family.